Data Discovery, Analysis and Export. Jane’s Data Analytics Explorer leverages structured data and visualisation software to provide a tool box of applications to support your day to day tasks. 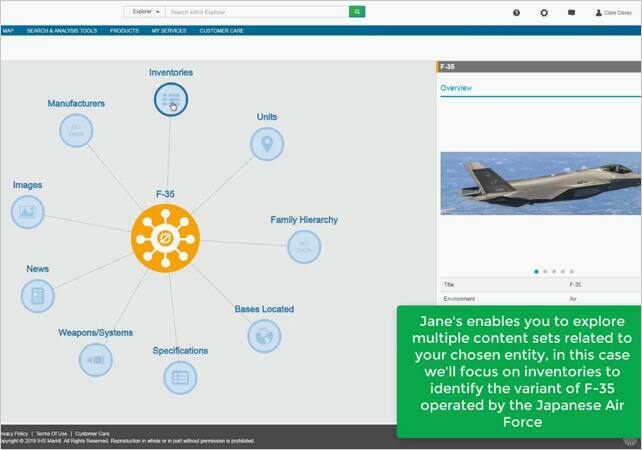 Underpinned by Jane’s verified and validated open source equipment, security and defence industry data, Jane’s Data Analytics enables you to rapidly and accurately identify, assess and present the relationships between entities that drive global security threats and opportunities. 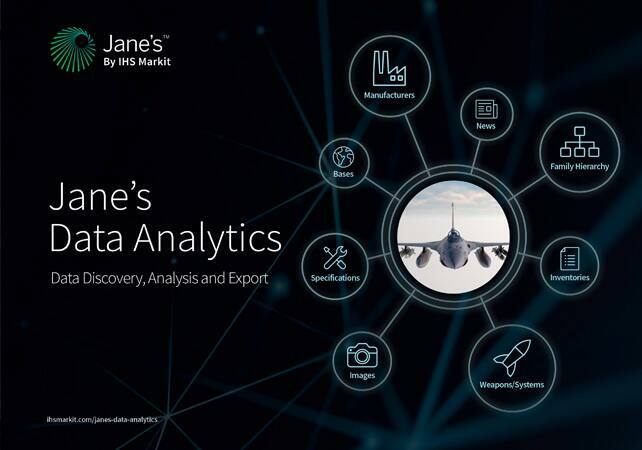 When you choose Jane’s you instantly gain access to the world’s most comprehensive database of structured open source equipment, security and defence industry data. With the addition of Data Analytics this vast resource can be quickly and efficiently used to reveal connections between entities, saving you hours of trawling through unstructured text to extract the insight you need. Underpinned by Jane’s Defence Equipment and Technology data, Equipment Exploration supports entity recognition and capability assessment. Leverage structured data facets, including roles, manufacturers and country of use to identify unknown equipment with guided navigation. Searching Jane’s proprietary equipment dictionary enables you to quickly narrow your equipment search options. Equipment physical and performance specifications drawn from Jane’s equipment profiles. Underpinned by Jane’s Military Capabilities data, Military Unit Exploration enables you to quickly understand the capability of a military organisation or country to assess threats or identify opportunities. 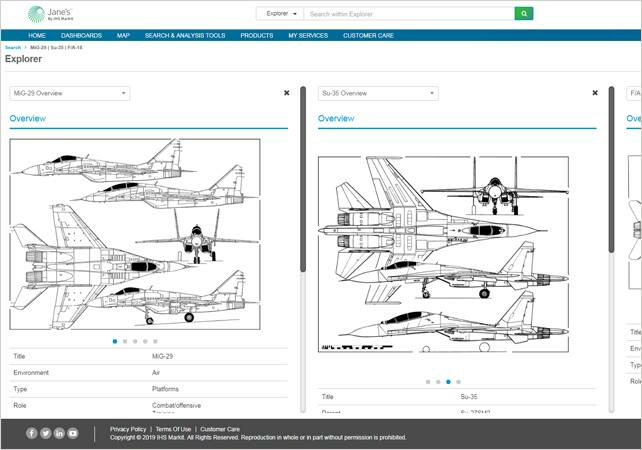 Select and compare entities to include equipment and units for side-by-side comparison, display and image export. This critical tool supports both equipment recognition and capability assessments. Inventory explorer enables you to build exportable lists of global military air and land platform inventories at variant level. Interactive tableau dashboards deliver filtering and visualisation capabilities that are genuinely intuitive and simple to use. Spanning Jane’s equipment, military capabilities and defence industry content sets the dashboards support faster, more effective analysis and knowledge sharing. Nine dashboards including weapon and platform search and comparison tools. Ten dashboards including worldwide military inventory and personnel comparison tools. Dashboards that enable you to carry out trend analysis and analyse regional reports. Enhanced entity discovery, analysis and export to support national security and defence industry workflows. Quickly narrow the field of possible matches when identifying an unknown entity. Efficiently and comprehensively compare entities to precisely identify equipment, organisations and capabilities. Data can easily be used to support further analysis, training or operational requirements. Identify the specific comparative and contextual capability of a weapon system, military organisation or country to assess the threat posed to your mission. Quickly and efficiently build a contextual understanding of the operational environment. Identify relationships between entities to meet specific analytic and display requirements. Assess the competitive business environment and identify opportunities.